The PLAYmakers' Blog | The latest news on TO PLAY Toronto! There is something about this time of year that has everyone in a bit of a frenzy. Perhaps it’s because mother nature is ready to give us some nice weather (or atleast a taste of it) or perhaps it’s because it’s just that time of year. Our challenge to you is: TO PLAY and play well. Get out there, enjoy the nice weather, join a team, learn a sport, experience a sport. PLAY. Spring has sprung. It’s time TO PLAY my friends! Read this article in the March 15th issue of Sports Illustrated, and I couldn’t NOT post it – it was written by Chris Ballard, author The Art of a Beautiful Game. Next month my father turns 71, and by all measures medical and practical he shouldn’t be playing basketball. Six years ago he had both knees replaced, the eroded cartilage switched out for titanium joints. Doctors told him never to run again. Then last year his right shoulder—his shooting shoulder—started to go. Inflammation, the doc said. It’s therapy or surgery. For many people Phil’s age that would have been that. Time to retire the rec specs, hone the putting stroke, buy some Rockports. But of course giving up a game isn’t merely giving up a game. My dad grew up in Indiana, where a jump shot is required as proof of citizenship. His father played semipro ball, teaching Phil how to start his shot low and release it high, launching J’s as if out of a shower stall. Dad continued to play through school, then through the long days and short nights of parenthood and medical residency, sneaking out for lunchtime games of pickup. For my older brother and me, hoops was the language of family. We never “talked it out” with Dad, a laconic, humble Midwesterner who can make a 45-minute drive in near silence feel comfortable. His idea of a heart-to-heart was preaching the prudence of bounce passes; our dialogue came in games of three-on-three on our makeshift backyard court, Phil taking it to the other dads. We spent countless twilight hours playing H-O-R-S-E at the park, and often the only sound was the hiss of the ball and the shiiing! of its arrival into the metal net. Who needed words—wasn’t the meaning clear? As my brother and I got older, the connection held fast. There was the time, 15 years ago, when the two of us had a playoff game in a high-level Philly rec league and only three guys showed up. With no other options, we called home, where my parents were in the middle of a nice lamb dinner. Dad put down his fork and 10 minutes later he was at the gym, hightops in hand. Some people ask their fathers for a car loan; we ask ours to play the top of a makeshift four-man zone on a full stomach, a 55-year-old in sweatpants trying to stop dribble penetration from 23-year-old former college players. We almost won, too. So it struck me like a thunderclap last year when I heard the teenager at the gym say, “Who’s the old guy?” The kid was standing at midcourt and pointing at Phil, but he couldn’t be talking about my dad, right? He wasn’t old. Sure, my brother and I usually rigged the teams so we could play with Phil, and yes, he had become mainly a half-court spot-up shooter, and granted, his hair was gray and his knee braces thick. But the old guy? I wanted to tell the kid he could learn a thing or seven about ball movement and court presence from watching this old guy, tell him how Phil used to be able to jump out of the gym, but I knew how stupid it would sound. Dad spent all those years fighting the impulse to protect me out on the court; I owed it to him to do the same. Then again, if the kid wondered why Phil was out there, well, it was a fair question. Why choose to endure an afternoon of searing shoulder pain to get banged around by men half your age when you could be sitting in a golf cart like most self-respecting 70-year-old doctors, talking about mutual funds? Many days at the Y, Phil’s the oldest player by 30 years. And since pickup basketball is survival of the fittest—win or get off the court—every twentysomething he guards sizes him up as an easy mark. Two months ago Dad and I were on the same team at the Y. As usual, the defense sagged off the old guy, daring Phil to shoot and, as usual, he hesitated. But he hit the first shot, and then a three. Emboldened, Dad went in the post and unfurled a little jump hook. Money! Then an up-and-under, spinning away from the defense like a creaky ballerina and bringing a whoop from the sideline. After winning two games, we faced a stacked team. Soon, the score was tied at 19, next basket wins. By my count Dad had hit seven of his eight attempts. Yet the defense again left him open in the corner. As he caught the ball, he ignored his shoulder and the two men racing at him and his balky knees, and pushed his shot up and out, just like his dad taught him, just like he taught us. And then, the moment we all play for, no matter our age. As the ball dropped through the net clean, I roared in triumph and the opposing players argued about who left the old guy open. And Phil—well, as usual, he didn’t say anything. You know you want to. We know you want to. So let’s make it happen. 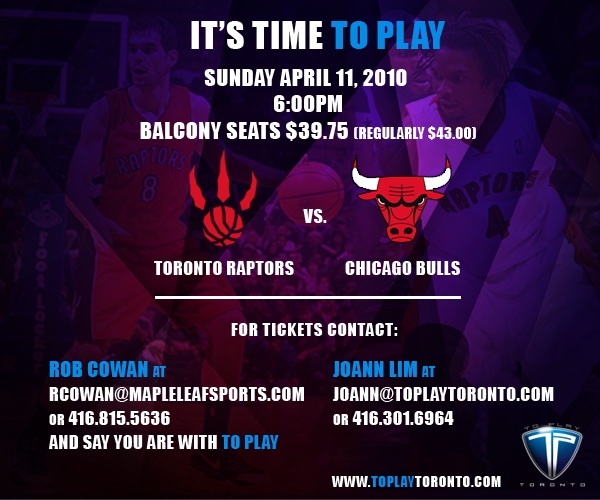 On Sunday April 11th, 2010, come join the PLAYmakers and everyone you know as our Toronto Raptors take on the Chicago Bulls in their second last home game of the season. The discount tickets are in, we just need you to make the call. Bring your family and friends and let’s make this event one to remember!